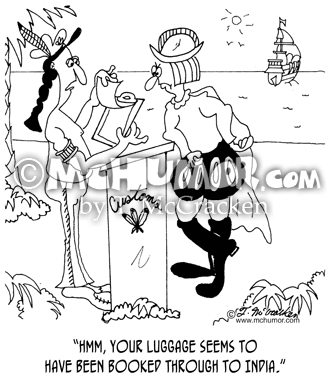 History Cartoon 5669: An American Indian with a clipboard saying to Columbus, "Hmm, your luggage seems to have been booked through to India." 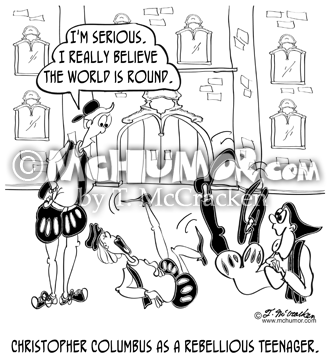 History Cartoon 5670: "Mama Columbus trying to give birth to the three day weekend." Mr. Columbus at her bed says, "What do you mean you're going into labor, dear? It's only Friday. 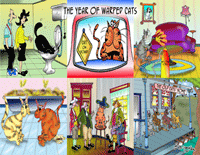 Can't you wait 'til Monday?" 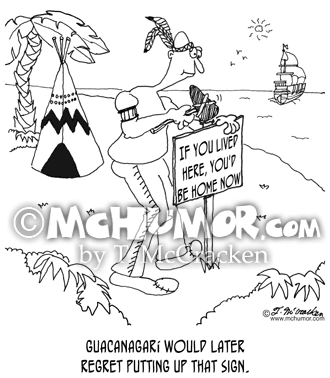 Columbus Cartoon 5673: With Christopher Columbus's boat in view a Native American puts up a sign that says, "If you lived here, you'd be home now." 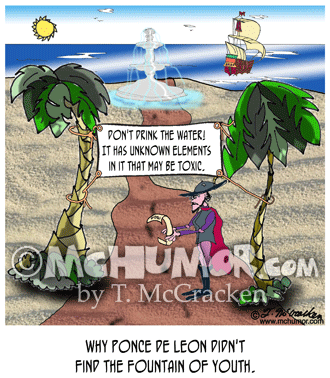 "Guacanagarí would later regret putting up that sign." 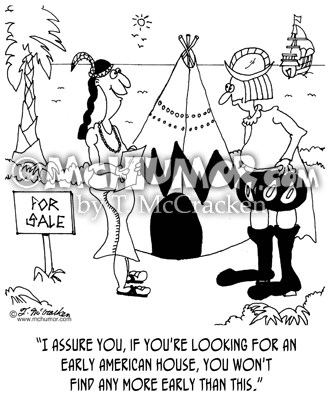 History Cartoon 5672: A Native American real estate agent showing Christopher Columbus a tee pee that's for sale, "I assure you, if you're looking for an early American house, you won't find any more early than this." 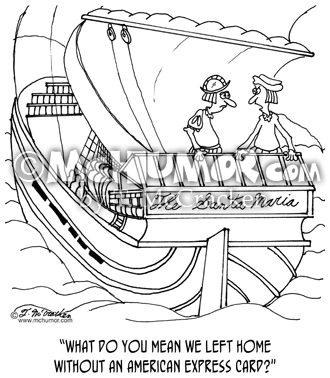 Columbus Cartoon 5671: Christopher Columbus on the Santa Maria asks a crew member, "What do you mean we left home without an American Express Card?" 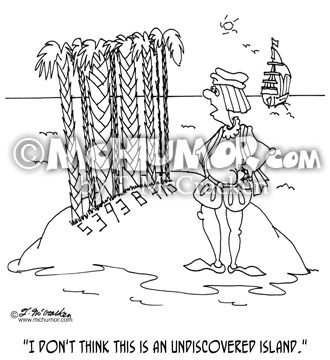 Columbus Cartoon 5800: Columbus on an island where all the trees line up in barcode like fashion says, "I don't think this is an undiscovered island." 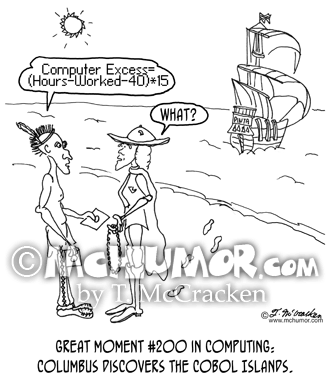 Columbus Cartoon 1333: "Great Moment #200 in Computing: Columbus discovers the COBOL Islands." An Indian says to Columbus, "Computer Excess = (Hours-Worked-40)*15" Columbus asks, "What?" 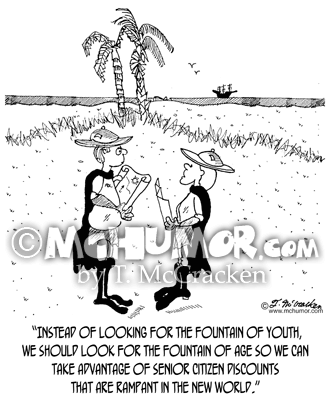 Geriatric Cartoon 2848: An explorer saying to Ponce de Leon, "Instead of looking for the Fountain of Youth, we should look for the Fountain of Age so we can take advantage of senior citizen discounts that are rampant in the New World."